I am playing an amateur weather forecaster tonight. After the crazy amount of rain that we got last night, I woke up this morning to a thin layer of snow but otherwise a bright and sunny winter day. Sometime in the afternoon though, it started to drizzle and later in the evening, it turned frigidly cold. It feels like we’re getting all seasons in a day. I guess weather gods have hard time deciding which condition to unleash on us. 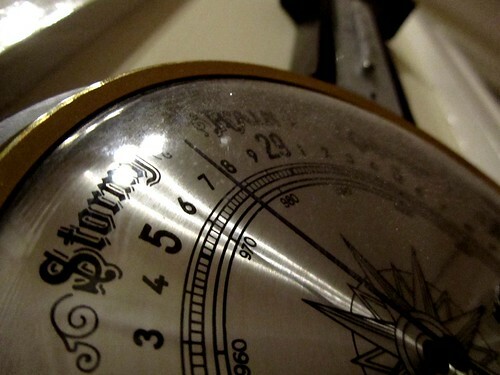 So I had a peek at the thermometer-barometer-hygrometer. The thermometer registers about 17-18°C/63-64°F (and yes, this is chilly for indoor temperature *), the hygrometer indicates a fair humidity level, while the barometer marks between “rain” and “stormy”. Somehow, I feel there should be a snowy option, perhaps sitting between “rain” and “fair”, where “change” usually is. Afterall, rain is characteristics of low pressure, whereas high pressure is usually associated with a cold front that brings about clearer skies. Therefore, for the barometer to sit between “rain” and “stormy” right now, it doesn’t seem quite right. Hmmm, maybe the gadget is broken? I shall recheck the measurement in the morning. * Not that we have much choice. Current water shortage in Dublin means water restriction is in place (often, for some 15-16 hours daily – on New Year’s Day, 20 hours!!) and it wrecks havoc with our heating system that requires water to run. yes, but it also taught me to appreciate the availability of clean water on demand. we’ve too often taken the privilege for granted.